So, Delhi airport is to become the world’s most expensive for airlines. It’s one of those stories you barely notice, just another sign of India’s booming economy — until you stop to think: it doesn’t make any sense at all. India’s aviation sector is in crisis. 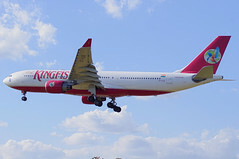 Kingfisher Airlines, the toast of the industry a few years ago, is on the verge of collapse, unable to pay its pilots’ salaries or its fuel bills, its international flights cancelled, its domestic operations pared back to the minimum. Air India would be in the same mess if it didn’t, as a nationalised airline, have endless government subsidies to fall back on. Sure, India’s economic boom has massively increased demand at the airport over the last decade. But it’s still nowhere near New York’s JFK or London’s Heathrow yet. And right now, demand for landing slots at Delhi is going down, not up. And the airport is jacking up its charges to the most expensive in the world? Perhaps the consortium that operates the airport thinks it’s fair recompense for the vast, gleaming new Terminal 3. That would be more palatable if it was really as great as they think it is. Sure, it looks fantastic. And the old international terminal was abominable, with wires hanging down from the ceiling, and a stench of rotting damp everywhere. But as some one who used that old terminal on a monthly basis, I found it had one quality much better-looking airports don’t: everyone who worked there had one aim, to get passengers through to their planes as quickly as easily as possible. After the Thai military coup of 2006, I had to get from Delhi to Bangkok in a hurry. There was just time to make the last flight of the day. My travel agent sent a courier with my ticket on a motorbike to meet me at the airport door. On the way I got a flat tyre. I arrived at the old Delhi terminal 20 minutes before take-off. The staff got me through security and onto that flight. And we took off on time. In the new Terminal 3 I’ve arrived a good deal earlier for a flight and been turned away, told I was too late. The friendly helpfulness of the old tumbledown terminal has gone. With the shiny new concourses and plate-glass windows, Terminal 3’s international operators have imported another feature of modern airports: surly, unhelpful staff who seem to feel their purpose in life is to make it as hard as possible for people to make their flights. Indeed, I wonder if cities should aspire to modern, impressive airports at all. There seems to be a strange rule in operation, whereby some of the world’s best airports are in the least attractive destinations, while the world’s most desirable cities have hellholes for airports. Baghdad under Saddam Hussein had a magnificent airport. Karachi has a fine airport, but if you want to stay alive it’s probably best not to leave it until your flight back out departs. London’s Heathrow is a place to lose your soul, Gatwick is even worse. New York’s JFK has great terminals, but for some reason you get stuck waiting on the plane for a take-off slot for hours. Paris’ Charles de Gaulle is so bad one wonders if the French are keeping it going as a sort of joke. As to what is going on at Delhi airport, I can only guess that the consortium that runs it thinks it will get away with charging more, airlines will just grumble and pay up, and pass the costs onto passengers. Whether it will remains to be seen. Reports say the increase will hurt the Indian government’s ambition to make Delhi a hub airport. But they needn’t worry too much about that: there’s little chance of Delhi becoming a hub while India still has ridiculous visa rules that mean a tourist can’t return for two months after their last visit, even if they have a valid visa. However pleasant the new concourses are, why would you sit at Delhi airport for hours when Dubai or Singapore will let you head into town for an afternoon before your connecting flight? Ever since Jersey built its shine new departures terminal tourism numbers have been shrinking. perhaps you are onto something here that once a place builds a nice new airport it all goes down hill. A bit like the well know fact the moment a big company builds a new head office sell their shares as they always seem to go wrong after building a new HQ perhaps the CEO and team spend to much time designing offices etc and not running the company. Perhaps the new airport makes a place just feel like any other when you arrive rather than the old run down one which have character and give fun lasting first impression and things to talk about?